I am delighted to announce that the fabulously talented top international WCS Pros Maxime & Torri Zzaoui will be coming over once again exclusively for West Coast Swing UK for the first May Bank Holiday Weekend of the year from 26-28 May 2018 for an intensive workshop weekend including a special Bank Holiday Monday Flashmob Workshop + Social! Maxime & Torri have some availability for one or two private lessons slots throughout the workshop weekend. Email cat@westcoastswing.co.uk as soon as possible for availability and prices! 19:30-23:45: Party/Social with music from Graham Burke & Guest Deejay Neil Mayes plus special performance by Maxime & Torri! £12 – Saturday night party only – spaces limited so pre-booking essential! This rate is for Saturday 26 May! Email groupreservations@him4j4.co.uk quoting “West Coast Swing UK” to benefit from this offer! To book a private lesson with Maxime and/or Torri, please contact Catriona for availability and prices. To book a private lesson with one of the team, please contact any of our teachers via our “Meet The Team” page where they will advise you of their availability and prices. A £5 floor fee per private lesson per hour will be payable on the door in addition to the cost of the private! Maxime started dancing at the age of 5 in Lyon, France. He studied contemporary at the Conservatory for 6 years before starting his career in the West Coast Swing community. He is now one of the top male professionals and was the first European to place in the top 5 of the Classic division at the US Open 2012. Torri began dancing when she was 3 years old in California, USA. She has studied other dances, but has always been a part of the West Coast Swing community. She has won the Young America/Young Adult division a total of 6 times at the US Open. Torri was the first and only person to win both the Classic and Showcase division in the same year at the 2010 US Open and continued to win the Showcase division for the next 4 years. Maxime & Torri recently decided to build a partnership and travel the world teaching together. They love the fun and social atmosphere of West Coast Swing and always want to make their classes informative yet enjoyable for everyone. 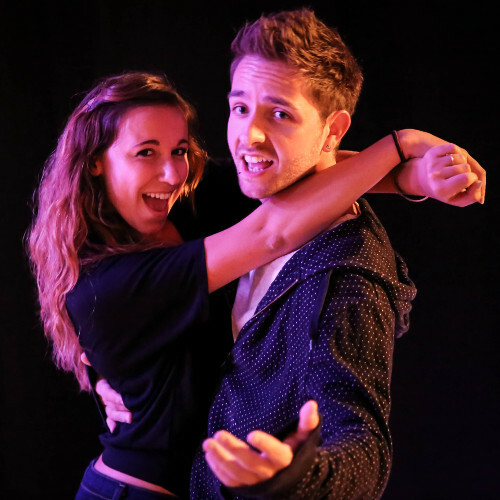 To find out more about Maxime & Torri, check out this link! To see Maxime & Torri dance, check out this link!